Ochtersum 6 km from Esens: Cosy semi-detached house "Vosshörn", surrounded by trees, meadows and fields. In the resort, 16 km from the sea, 16 km from the beach. In the house: central heating system. Parking at the house. 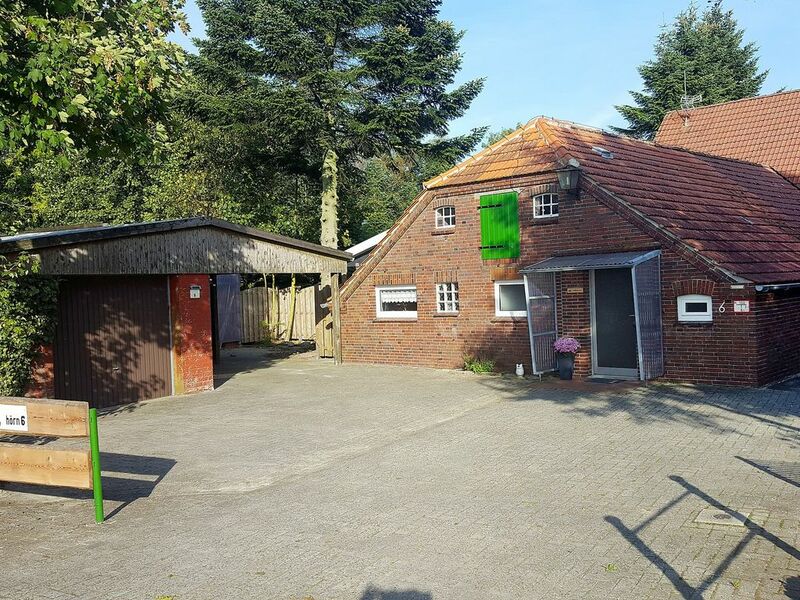 Supermarket 6 km, restaurant 8 km, bakery 7 km, café 8 km, railway station "Esens" 10 km, ferry "Langeoog" 16 km, sandy beach "Bensersiel" 16 km, outdoor swimming pool 16 km, indoor swimming pool 16 km. Golf course (9 hole) 24 km, riding stable 500 m. Please note: car recommended. "An der Tanne", 3-room semi-detached house 90 m2, on the ground floor. Cosy furnishings: living room with satellite TV (flat screen), radio. 1 room with 2 beds (90 cm, length 200 cm). 1 room with 1 double bed (2 x 90 cm, length 200 cm). Kitchen (oven, dishwasher, 4 ceramic glass hob hotplates, microwave, freezer, electric coffee machine) with dining table. Exit to the terrace. Bath/shower, sep. WC. Terrace 20 m2. Terrace furniture, barbecue. Please note: non-smoking house. Maximum 1 pet/ dog allowed.